A fascinating building rises picturesquely on a light plateau in the middle of the HUF village. The outlines of the slim wood-glass construction in the landscape are elegant. Anyone who wonders how the classic components of timbered architecture can be interpreted even more intelligently and in an unprecedented way will find the answer in the crystal-clear HUF show house “Ausblick”: Maximum transparency characterizes the appearance of the filigree bungalow as well as the impressive “Butterfly roof” that makes the architecture of the house look even finer and more open. This slightly different roof surfaces create a barely noticeable asymmetry in the otherwise very rhythmic and stringent exterior, which immediately becomes an eye-catcher. The butterfly roof is oriented in its shape to the nature and symbolizes the beauty of a Falters. On average, Urbanscape® Green Roof System is much lighter than other regular green roof, so it can be installed also on lightweight constructions and to differently shaped and inclined roofs, what the HUF “Ausblick” house absolutely has, where traditional green roof systems are not possible. The lightweight design of Urbanscape ® Green Roof System does not compromise the structure stability and at the same time provides good stormwater buffer (stormwater management) through natural evaporation, herewith cooling the roof of the house and represent an advanced performance regarding the energy efficiency. 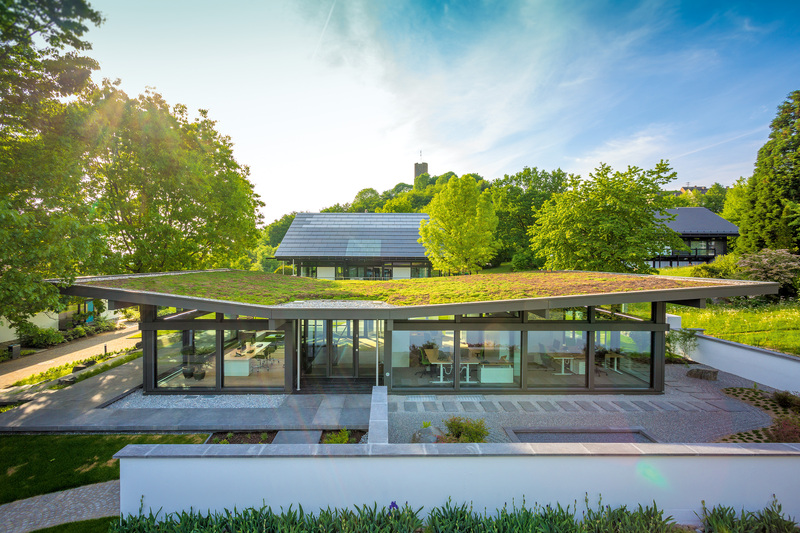 Furthermore, the sedum roof increases the biodiversity in the urban area by providing protection and a source of food for bees, butterflies and other insects. The architecturally cleverly planned and built house with Urbanscape Green Roof on top, combined with the innovative engineering and architectural aspiration of the HUF House, creates a harmonious whole that harmonizes the life of man, house and nature – architecture in its most intelligent form.